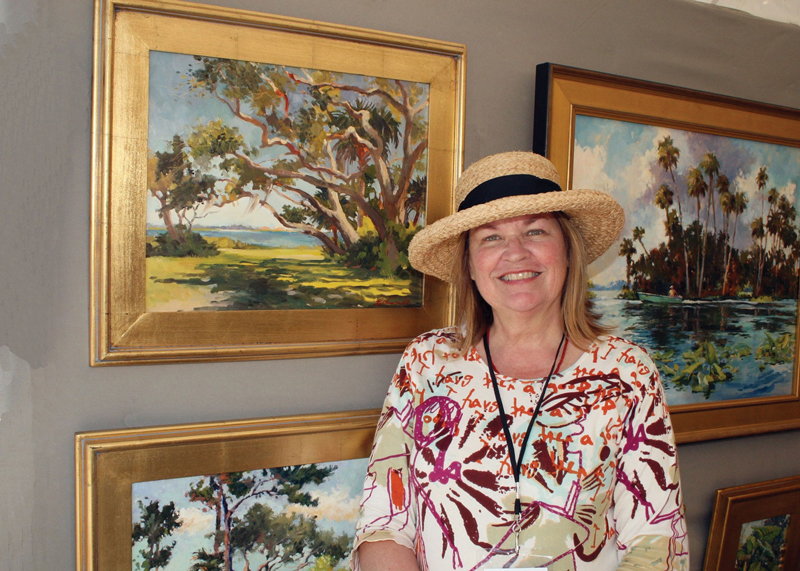 Award-winning plein-air painter Cynthia Edmonds discovered her passion for art while taking classes at Rollins College as a child growing up in Winter Park. Her love of art led her to high-school art camp at Florida State University, where she returned to earn a bachelor’s degree in fashion illustration. Edmonds worked for many years as an advertising illustrator for local fashion retailers, including Ivey’s, Jordan Marsh and Hattie Frederick. She later earned a master’s degree in fine art from the University of Florida and moved to Washington, D.C., and later Seattle. There she worked as a photo art director and catalogue designer for Nordstrom while simultaneously discovering the wonder of oil painting. Edmonds, who returned to Florida in 2001 to devote her time to painting its colorful landscapes, now lives in the Winter Park house where she was raised. A signature member of the American Impressionist Society and Plein Air Florida, she participates in plein-air exhibitions throughout the U.S. — including the annual Paint Out Winter Park, sponsored by the Albin Polasek Museum & Sculpture Gardens. The cover image on this issue of Winter Park Magazine, “Lake Berry Bananas,” was painted during the Polasek’s invitation-only event, when artists fan out across the city looking for intriguing subjects. Edmonds found this tranquil setting along Lake Berry, near the Windsong neighborhood. Edmonds’ paintings can be found in collections at the University of Central Florida and the Maitland Art Center. Her paintings are also included in the St. Joe Company’s Forgotten Coast Collection and the Shands Arts in Medicine Collection at the Venice (Florida) Regional Medical Center. Aficionados of Winter Park Sidewalk Art Festival memorabilia will recall that Edmonds’ image of Greeneda Court on Park Avenue adorned the official festival poster back in 2007. Edmonds loves to paint in her certified wildlife habitat garden, but also finds inspiration in France, Italy and Maine. More of Edmonds’ work can be seen at www.cynthiaedmonds.com.